Well, Dakota did it again. He got in trouble. It may not really have been his fault, but I’m the author so I can’t blame myself, can I? Do you remember when I told you that I was throwing up a lot and staining the rugs? Based on Dr. McNaughton’s advice, Mommy changed our food to Blue Buffalo. It’s quite yummy and guess what? I hadn’t thrown up since I started eating it! Mommy had just told my Aunt Michele that I was doing better when the Bark Box arrived! It was so exciting! Every month we get a new box of treats. Plus some of the proceeds benefit the Mr. Mo Project. This foundation fosters senior dogs and takes good care of them. Check it out at http://www.mrmoproject.com. 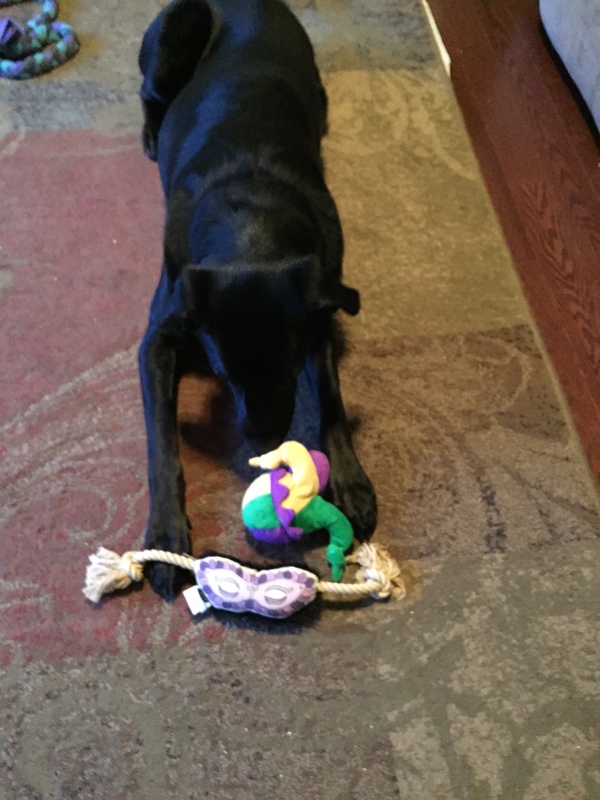 The items included Mardi Gras themed toys and there were some delicious natural treats. Daddy gave me one and it was fantastic! Dakota loves the jester ball. 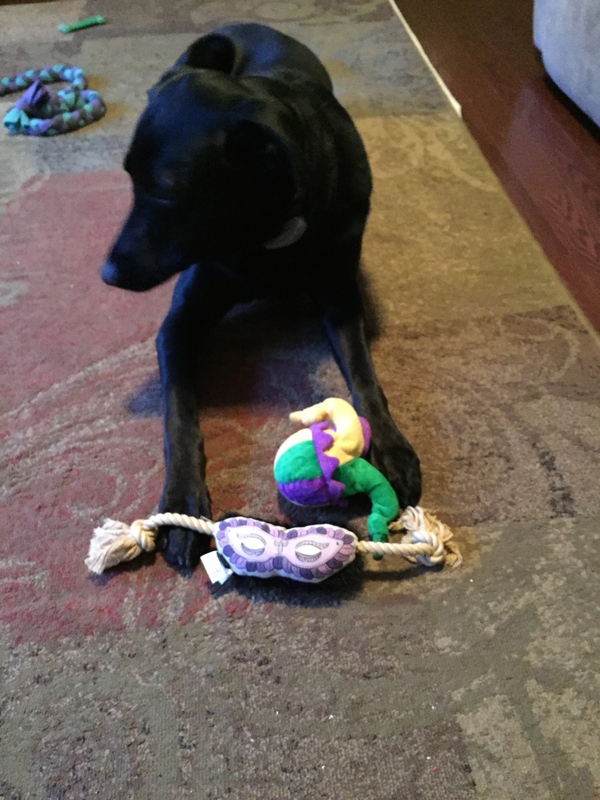 The Mardi Gras mask was yummy! Stay tuned for my next blog to hear about that! It was the next day and I was up in Mommy’s office with Dakota and Stephen. I don’t know what happened, but all of a sudden, I started heaving. Mommy jumped out of her chair and yelled for me to come downstairs. I don’t know about you, but it’s very hard to start running when your stomach feels like it’s coming out of your mouth! Dakota thought it was a game of course and as Mommy ran down the stair, expecting me to follow, Dakota ran after her. You guessed it! He took Mommy’s feet right out from under her! Now I didn’t know if I was going to puke from those treats I ate or from Mommy’s impending doom! I should have known that Mommy would land on her feet. She must be part cat! She held onto the railings and slid all the way down on her slippers! I swallowed whatever was coming up and ran after her to see if she was all right. She did yell at Dakota. I don’t think he realized what he did. He just gets excited. I cracked up because Stephen asked from upstairs if Dakota fell down the stairs again?! We are a klutzy family! I have fallen down those stairs numerous times! Mommy pulled her shoulder a bit, but hopefully it will heal quickly. Mommy told the story about how my angel brother, Nick, fell down those same stairs when they first moved into the house. Apparently, Mommy cleaned the stairs with Murphy’s Oil! She needs to take some lessons from my Aunty Karen! Poor Nick! Stephen said he yelled “Ow!” down the whole flight! We all make mistakes, but Mommy always forgives us. It’s just your Shadow, Dakota! If you think about it. Dakota’s middle name should be Shadow, not mine. His middle name is Kenny. It came from the South Park show and Kenny was Stephen’s favorite character. But I digress from the standard introduction of my blog. It’s a blustery winter day, with the wind blowing underneath my coat. Mommy is getting her Starbuck’s with her BFF and pondering the ways of the world. Stephen is sitting on the couch in his underwear. Gross! And Daddy is at work. Anyway, back to Dakota’s shadow. Let me tell you a little bit about my younger brother. Dakota joined our family when I was 2. He was malnourished and scared. He was found in a dumpster in Tennessee. He is currently 100 pounds and his bark can be intimidating. I have no doubt that if anyone tried to hurt me or my family, Dakota would protect us. Daddy has taught him how to put tennis balls into a machine that will launch the balls. He is great at jumping high in the air and catching the ball in his mouth. He’s playful and will run around until he literally falls over. But if you have had the pleasure of hanging out with me and Dakota, you will notice that Dakota sees ghosts! Ha! I’m just kidding! Dakota thinks that the shadows on the walls and the floor are some type of enemy invading our house. Or maybe he is reliving his life on the streets when any little movement made him run for his life. It could be his flight or fight response. He jumps up on the wall and Daddy yells at him because the wall gets covered with his nose prints. He’ll pound the floor with his paws trying to stamp out the movement that is causing him distress. He actually has cried because it doesn’t go away, and he ripped up our linoleum floor with his teeth! Zoey, is that a ghost? Sometimes I can’t stand it. I growl and jump on him to get him distracted. He is very persistent in his diligent attempt to protect our home, but how sad that he never feels fulfilled in his assassination attempts! It must be so frustrating for him. I have tried to explain to him that it’s just his shadow, but he doesn’t believe me. Or maybe he just likes to entertain the family with his blank stares at the ceiling. No matter how long Dakota chases his shadow I’ll still love him. Everyone has a purpose in their life and Dakota’s is chasing the ghosts from his past. Watch the video of Dakota in action on my Facebook page. It’s a quiet and cold night. Everyone is sick of the cold and the snow. I know I am! Daddy is constantly outside blowing the snow around and right now Mommy is out there with him, so I get my chance to reflect. I admit when I was little, I loved running around in the snow. My coat is pretty thick even though I don’t really shed like Dakota. My paws tend to get cold quick. Daddy refuses to let Mommy put pawshoes on me. The other thing I don’t like about the snow is trying to poop. Let’s face it! It’s hard to squat and do your business when the cold snow is right on you! If that isn’t bad enough Dakota always invades my space. Yes, Dakota I am pooping. It’s cold out and I just want to get it done! So lately I have been pooping and peeing on the patio and Oh Boy! Daddy does not like that! He cleared a path in the yard for me and Dakota to do our business on. It’s very funny, but as I look out the window, I can see poop flying through the air with the snow! There’s not much for me to do in the snow. Not so for Dakota who just loves being out in the snow. He’d live out there I think! 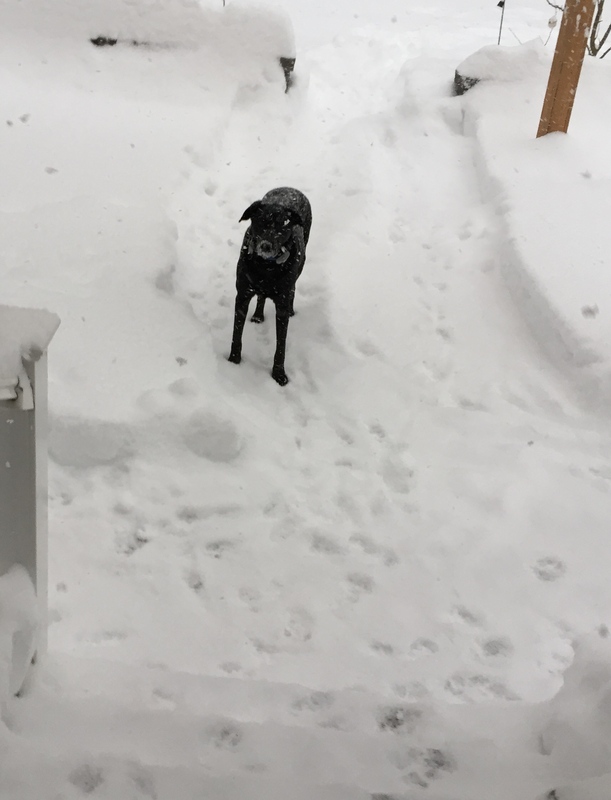 He runs and gallops over the big snow drifts. Daddy put all Dakota’s tennis balls in a bucket in the garage and the other night he told Mommy that Dakota had emptied the entire bucket. He finds the balls in the snow and sometimes Daddy finds them with his snow blower! Eek! Dakota will lay on the patio and wait for someone to come out and play. Or he’ll bark at the four dogs who live next door. Dakota will catch snowballs until springtime! He jumps in front of the shovel, just so he can feel the snow on his face. He looks so funny with a white beard! I gotta say Dakota makes the best of every kind of weather. He plays in the snow, digs in the grass, licks puddles when it rains. He has a very positive outlook! Dakota enjoying his snow day! Me? Well I just want the sun. In the afternoon when the sun is just over the trees, it streams into our family room. So I lay there and get my Vitamin D. We all need some sunshine in our lives. Dakota just makes his own. Is it cold enough out there for you? I had to thaw my paws in front of the fire before I could start typing. Mommy drove to the store and Dakota is sleeping under her desk so now is the time to write my blog! 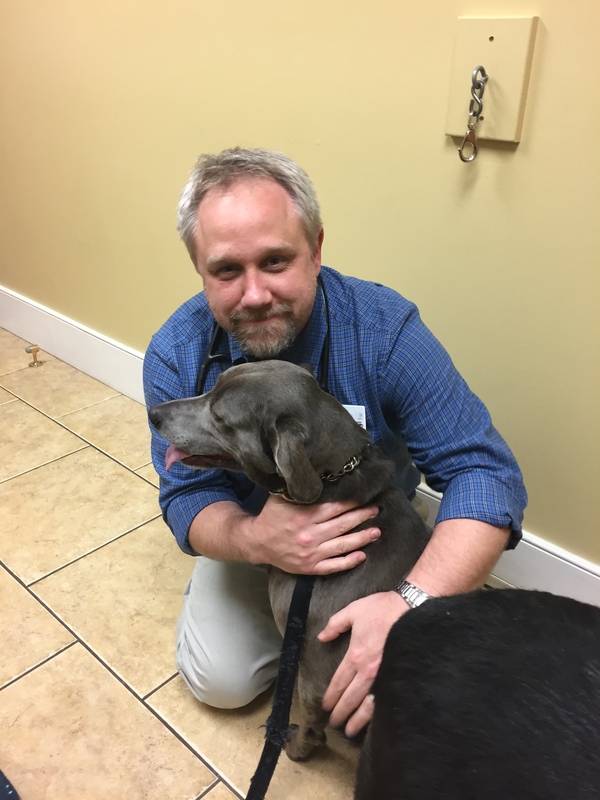 Last week Dakota and I had our visit to the vet. Stephen came with us and I was a little confused because we usually go to a place right around the corner from our house. This time we drove a bit longer. Dakota got anxious and he tried to jump over the back seat to get closer to Stephen but he got stuck! It was very funny, although he didn’t thinks so. Anyway, we stopped at a very big place. I heard Mommy tell Stephen it was the Burnt Hills Veterinary Hospital. I got nervous because I don’t really like new places, but I didn’t like our old place anymore, because my favorite Dr. McNaughton didn’t come see us anymore. Mommy didn’t know where he went and I didn’t much like the other vets. They didn’t understand Dakota’s enthusiasm and would put a muzzle on him. That only made him more nervous. 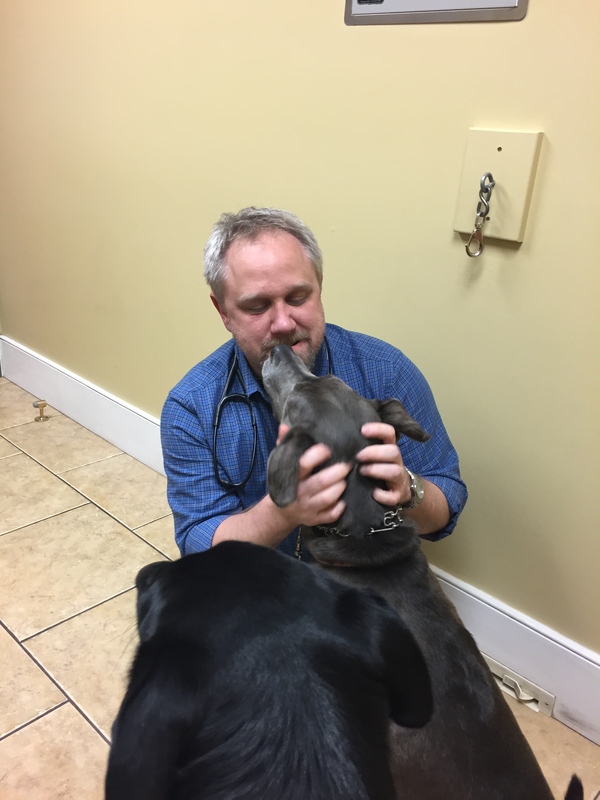 Dr. McNaughton always sat down on the floor with us and he would let me lick his face as much as I wanted. I went to the front desk to check in with Mommy and Stephen held onto Dakota. He was even more nervous than me and he kept whining and howling. He settled down once I was next to him. After a few minutes It was time for us to go into a back room. The scale they wanted us to step on was wiggly and neither one of us wanted to do it. Everything was so different. I thought maybe I wanted to go back to the old place. Then this nice lady took us around the corner and there was a flat scale on the floor. Dakota weighs 100 pounds and I am 63 pounds. We were brought back into the room and we waited. I was getting impatient, but then the door opened. It was Dr. McNaughton! My smile almost broke my face I was so happy to see him. I wanted to tell him about the last year and how I had been throwing up (he said it’s acid reflux and changed my food), and how much we have missed him. He just seemed to know all this and let me lick his face and his hands. Dakota kept getting in between us and stepping on his legs. I didn’t get mad, because I knew Dakota missed him too. Dr. McNaughton is as happy to see me as I am to see him! Dakota keeps trying to get the doctor’s attention when he’s supposed to be checking my belly! Giving the doctor all my loving kisses! 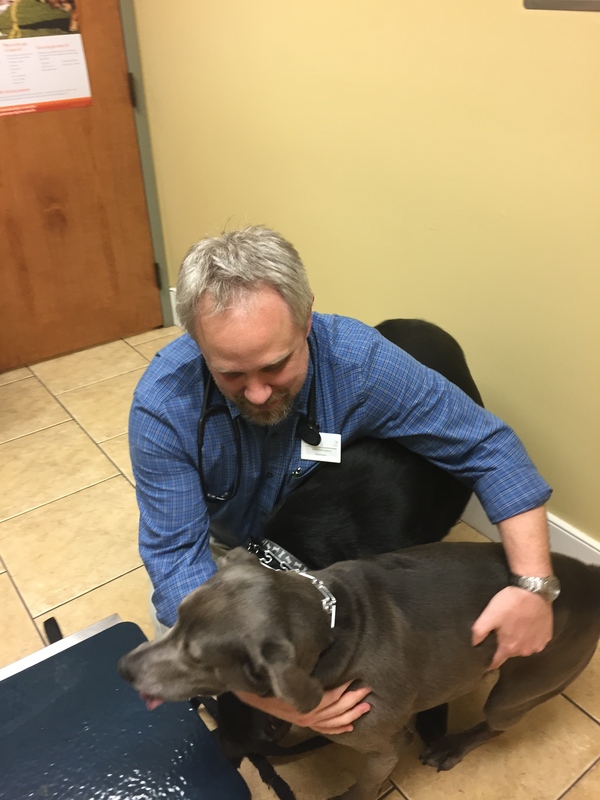 If you lost Dr. McNaughton, know he can be found at the Burnt Hills Veterinary Hospital! Tell him Zoey sent you!